A key portion in this passage is the word and concept “Shalom.” This important Hebrew word speaks to a prophetic vision of the way that the world ought to be. At Sunshine, we have grafted this vision into our work in our community: “We exist to seek the renewal of the city…” We exist to seek the Shalom of our city. In an attempt to fulfill this call through various ministries, the BridgeBuilders program has been developed and is an extension of our discipleship ministries. We have attempted to develop a program that fosters reciprocity, healthy relationships, and sustainable ministry by hosting teams of students who will learn and serve with us in our neighborhood. We invite you to explore how God is calling you to seek the Shalom of Chicago (and your city) because, in its Shalom, we believe you will find yours as well. We invite you to join us in seeking the renewal of the city. An indispensable aspect of our program is listening. If we neglect to listen to both God and to our neighbors, we will inevitably go astray. To address this, we provide space daily to listen both to how God is at work in Chicago and to the people who actually live here. Each day we will engage in a customized opportunity and get a chance to simply listen. Listen to how God is at work through his people in various forms of ministry. Listen also to the residents of our community and our city by interacting on a relational level. Afterward, we intentionally debrief each experience. One of the most powerful and beautiful aspects of our program is the learning that happens during the week. Any time you move cross-culturally there is the chance that you will learn something new simply by being present. But when you are intentional, when you seek out knowledge and wisdom from another context you can and will find the glory of God revealed in that culture. 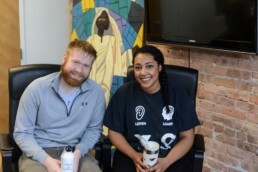 We believe that God has revealed aspects of himself in unique and powerful ways to those who are situated in an urban, low-income, minority populated community like ours and it is this that we offer to our students. Moreover, we have much to learn from our brothers and sisters in the African-American South-Side of Chicago in terms of history, sociology, economics, theology, philosophy, family and community dynamics and every other aspect of life. While listening and learning are primarily a way for our teams to receive from the city, our service component provides space for our teams to give back to our community. We hope to establish a level of reciprocity and connectedness by creating a time for students to give while they are receiving. To this end, we get our students and participants involved in various local service opportunities with our ministry and with our partners in the community. While the specific opportunities change from week to week depending on the needs of our ministry and partners, we have engaged in a variety of opportunities. We have had students engage in everything from building renovation projects to assisting with summer youth programs, from volunteering in local schools to painting murals. Our final goal for our participants is that they return to their own communities, churches, schools and homes changed for the better. We believe that our teams have the capacity to deeply influence and affect their own locales for the glory of God. By taking lessons and experiences from the Urban context and transplanting them into their daily lives our teams can use this week as a stepping stone to community transformation in their own context. While you’re with us, we’ll provide for you everything you need (except for transportation)! That includes housing, food, staff, materials, parking costs, CTA passes, and the schedule! While we handle the logistics of the trip, you are empowered to pour into the lives of your students and process with them the whole experience. Are you interested in signing up? Register today!